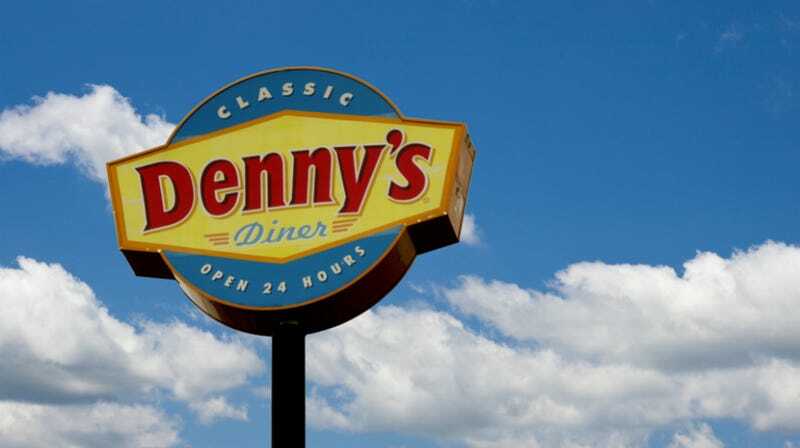 Via The Smoking Gun, Natasha West was a customer at an Oak Lawn, Illinois Denny’s just looking for some pancakes. Specifically, all of the pancakes, as she had ordered the $4 all-you-can-eat pancake special. When West was informed, however, that a singular order of the special only applied to her and that her entire party could not partake of her limitless flapjack bounty, police say she reacted poorly. West is alleged to have begun cursing and throwing punches at her server (the bearer of the ill hotcake tidings)—all of which apparently missed. The fact that West allegedly began cursing and wildly swinging at a server over $4 all-you-can-eat pancakes would be bonkers enough, but she and her party are also accused of leaving without paying their tab, with West supposedly kicking the holy hell out of a door on the way out. Police were ultimately able to locate West and her friends from a description of the car in which they fled the scene. West has been charged with assault and damage to property, while another member of her party has been charged with providing police with false identification. I think this is the first time Kitchenette has ever covered a batshit crazy news story from a Denny’s, and I am genuinely shocked it took this long.